BarCamp Tampa Bay 2011 is done and in the bag. There are so many people and organizations to thank that it won’t fit in 140 characters. First off, I want to thank Mayor @BobBuckhorn for his opening remarks and for taking time to see what the community is developing into as well as speaking with many of the attendees. Next I want to thank the sponsors without which we could never have put on such an event. In particular is Kforce for providing the fantastic facilities again this year. The staff is always courteous and helpful and have everything covered. Social Media Strategy (and execution) – @Antony511 and @MissDestructo at @HoLmedia. Art and Creative: @ariscreates. Web design, development, and management courtesy of @dandenny. The mobile apps were provided by @barryezel (iPhone) and @munday (Android). The Registration Desk was staffed by @PROJECT_steph (she’s responsible for general mayhem reduction, especially when I forget exactly how many rooms we had and where they were! ), @marketingZEALOT, @candidlyvic (let’s hope he heals up quickly!) and @blanka_creative! Wifi was managed by Jason Fraley (@oelbrenner) and Bill Williams (@flpatriot). Thanks for coming in on Friday to knock it out. I doubt that you missed him but videography was provided by Wayne Rasanan. PR was provided by Suzanne Boland at RFBCommunications. Coffee was provided by @BuddyBrewCoffee (the coffee was so good it disappeared in about 20 minutes!) The Pre-Party was sponsored and coordinated by BarCampTour (Wufoo, Shopify, Grasshopper, Mailchimp and Batchbook) Great meeting all of you and kicking off BarCamp Tampa Bay at the Tampa Museum of Art was a perfect place to have it. Well done! I also want to thank Linda @tampabayWaVE for giving me time and space to announce BarCamp in front of the WaVE crowd. 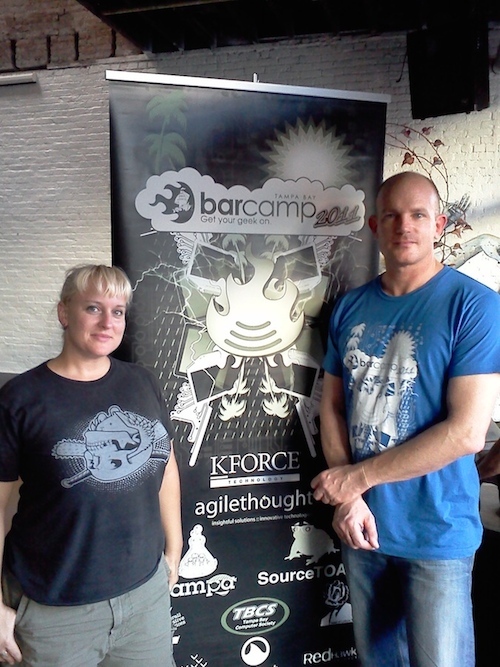 Last but not least, Peter Radizeski and Joel Lopez for working to bring BarCamp to Tampa over the past few years. You all have really begun to bring huge change to the area! I cannot express how happy I am to have worked with all of you. On a side note, I want to thank Marvin Scaff and Daniel James Scott of Gazelle Lab for giving me the latitude to run BarCamp while I’m launching a company. Thank you! If you want a great re-cap of the events from Saturday, take a look here. Hearing that the event went well from people actually in the sessions is very reassuring. On top of all of this, Joe Healey bought me 2 beers later that night. Great guy. Thank you and the lightsaber presentation hopefully inspired people to pick up the Kinect SDK. I want to take a moment to apologize to all the people who sat through what sounds suspiciously like a product pitch. I didn’t realize this happened until after the session and I can promise you that it will not be tolerated next year. BarCamps are no-pitch events, don’t even think about getting people to sign up for your event, platform, product or service. The only thing you should be presenting is your passion and your expertise. Attendees: if you feel like you’re getting a product pitch, get up and leave, that’s not what you’re there for. Where do we go from here? Well, planning for BarCamp 2012 will start sometime after 11/17/11. The organizers for 2011 still need to hold a retrospective, figure out what worked and what didn’t and make adjustments. From there we’ll start putting together planning meetings for 2012. We’ll probably leave the date around 9/23 next year, possibly we’ll back it up a week so we don’t conflict with the start of Little League season as we did this year. For now, all the organizers, sponsors, and attendees should feel confident that they participated in an event that supports the continued growth of the area – you’re building a great community – please keep it going.